The University of Edinburgh were experience signal drop and interference issues while using wireless microphones across the campus in over 320 rooms including a 400 seat theatre. The University replaced their existing wireless microphones with Sennheiser SpeechLine Digital Wireless microphones across the campus. The 'Multi Room' feature and automatic frequency detection ensures an interference free operation and robustness that the University was looking for. “The product fulfils its product promise, the investment is worthwhile, the digital frequency transmission and the automatic search for free frequencies in the 1.9 GHz frequency band (DECT) works well. - "No frequency problems at all". The University of Edinburgh is currently replacing its analogue Sennheiser microphones with Sennheiser's latest SpeechLine Digital Wireless microphone series. These Dedicated-to-Speech products are to be installed in 320 rooms. Stephen Dishon, the university's AV officer, took this step because SpeechLine Digital Wireless products can solve several of his problems at a stroke: they get around frequency traffic jams, avoid interference with other microphones and the batteries last longer. Last but not least, Stephen Dishon thinks the robust design of the German-made digital microphones will be useful in the tough, everyday life at the University. Profile The University of Edinburgh, founded in 1582, is one of the leading seats of learning in the UK with 30000 Students and a staff of 13000. Stephen Dishon is very much engaged. 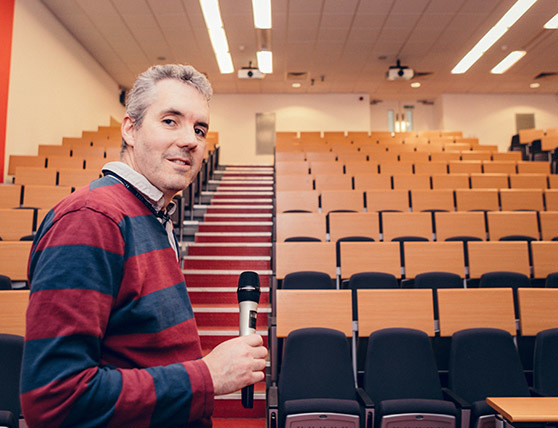 The University of Edinburgh development team supervisor is an active member of the AV community in Great Britain, a regular at industry meetings and conferences, and well known for his level of interest. The University of Edinburgh has a solid AV budget because the university is well aware that modern AV technology can help enhance learning successes. Dishons team is known as being front runners, quick to respond to market developments and willing to try out new technologies - all reasons why the University of Edinburgh is an AV technology leader in Great Britain. This commitment is actually necessary because more than 30,000 students and a staff of 13,000 make the University in Scotland's capital a leading seat of learning in the British Isles. For many years now, around 200 Sennheiser Evolution G3 microphones, 2000 series and 5000 series microphones have been doing sterling service in 200 rooms and lecture theatres. "They have been working reliably for more than 12 years and we never had to exchange any," says Stephen Dishon. Nonetheless, he is in the middle of a generation change. By early 2017, 40 microphones from the SpeechLine Digital Wireless product line had already been deployed, by autumn 2017 it will be about 100 microphone links. There are a number of reasons for changing the voice reinforcement technology used in Edinburgh: lecture recording is to be a university standard by the end of 2017. In the future, every single lecture will be digitally recorded. This raises the demand for microphones: 320 learning and teaching spaces - from smaller 5-person rooms to 400-seat theatres - need to be equipped with audio technology. Stephen Dishon quickly realised that this was simply not possible using the existing systems and traditional UHF frequencies. Although additional frequency licences aren't expensive in Scotland, the increased traffic levels on the UHF bandwidths - also because of additional hearing amplification equipment in the halls – further exacerbate the situation. "We saw the risk of traffic jams." Another factor is that rooms are often very close to one another, regularly causing microphone systems from several rooms to interfere with each other. The Scottish AV specialist was also persuaded by the fact that the microphone series is specifically designed for voice transmission applications. "We need voice transmission which is as clear as possible," Dishon says. SpeechLine DW products fulfil this requirement by delivering optimized speech intelligibility with its male and female presets. And that Sennheiser knows all about voice transmission is something previous Sennheiser products had amply demonstrated. 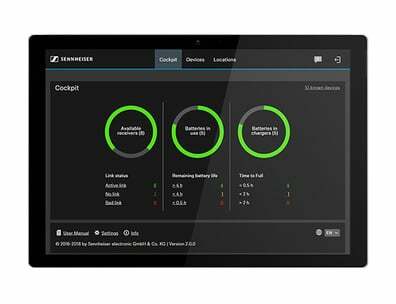 "We were happy with Sennheiser so far, so Sennheiser was our first choice this time as well." Battery capacity is also a plus point, in Stephen Dishon's opinion. During tough, everyday life at the university, it sometimes happened that the older microphones had to be charged between lectures, whereas SpeechLine DW microphones can operate for up to 15 hours without any problems. The remaining battery capacity is also more clearly displayed on the handheld and bodypack transmitters themselves than was previously the case and can even be seen on the receivers. Stephen Dishon and his team also like the fact that all SpeechLine DW transmitter (handheld and lavalier) come with a mute button as standard. That is indispensable in university usage, says Dishon. About 50 per cent of Edinburgh's new SpeechLine DW microphones are lavalier-models. Long life, robustness and the concomitant much improved positive return on investment are all key factors in purchase decisions. We might look at the price, Stephen Dishon admits, but he and his colleagues also take a long, hard look at investment sustainability. And the fact that the previous radio mics operated for 10 to 12 years "without any problems", and continue to do so today even bearing in mind their intensive use at the University. Dishon: "They just make their work." One simply notices that Sennheiser products are very well developed. Just one more reason for Mr. Dishon to keep faith with his microphone supplier. The SpeechLine DW solutions deployed at the University of Edinburgh are permanently installed in the lecture theatres; they are generally used without any technicians being present. The systems are directly connected to the built-in AV systems. Sennheiser Control Cockpit, Sennheiser's system monitoring software, is not presently used at Edinburgh but Mr. Dishon admits that as the number of SpeechLine DW systems increases the use of that software is a realistic option. The conclusion after several months of using the digital voice transmission solution: the product fulfils its product promise, the investment is worthwhile. The digital frequency transmission and the automatic search for free frequencies in the 1.9 GHz frequency band (DECT) works well. Despite the number of radio transmissions in the University of Edinburgh's lecture theatres is rising steadily: in some cases there are up to 15 SpeechLine DW systems in operation in very close proximity of one another. Stephen Dishon's sum-up: "No frequency problems at all".